If a “chinning” selfie is not what you were going for on your Instagram feed, you are in luck. With the latest advances in science, the photobombing double chin fat can be eliminated once and for all. A double chin is a common condition that occurs when adipose tissue (a.k.a. fat) collects in a pocket below your chin, called the submental fat pad. Obesity is the biggest risk factor for forming a double chin, however, genetic factors determining how fat is distributed and age related skin changes are also important. This means that losing weight does not guarantee the fat shrinkage will come from below the chin. For a double chin that won’t budge, two of the most cutting-edge, non-surgical options available are Kybella and TruSculpt 3D. Kybella is a version of deoxycholic acid, a naturally occurring molecule in the body that helps breakdown the fat we eat. It works by disrupting and destroying fat cells. To target a double chin, Kybella is administered to the submental fat pocket over a series of injections. Once eliminated, these cells can no longer accumulate fat, resulting in a noticeable reduction in fullness under the chin. Patients may experience stinging and burning during the treatment, followed by swelling and possibly bruising under the chin that may last for several days. Depending on the desired results, several treatments may be necessary. If fat dissolving injections sound too sharp, another option is truSculpt 3D. This treatment utilizes conductive radiofrequency (RF). Over a series of 4-minute pulses, controlled heat is delivered to the adipose tissue layer to disrupt and destroy the fat cells. There is little to no swelling or bruising and patients are able to resume daily activities. 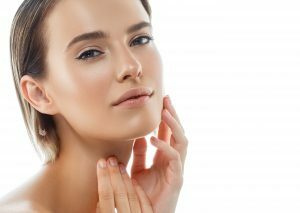 A decrease in submental fullness along with the added bonus of noticeable skin tightening can be seen in as little as one month. Several treatments may be needed for best results. Defining your jawline is easier than ever. To find out if you are a candidate for Kybella or truSculpt, call 212-431-4749 to schedule a consultation with a dermatologist.